NOSM serves as the Faculty of Medicine for Lakehead University in Thunder Bay and Laurentian University in Sudbury and, upon acceptance into the MD Program, students are assigned to one of these two host universities. 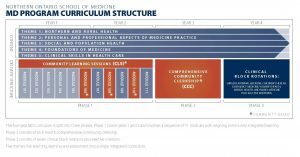 The MD Program curriculum is organized around five Themes that connect learning and assessment into a single, integrated curriculum. Medical students engage in a combination of small and large group learning, practical and lab learning, and significant community-based experiences that combine clinical, medical, and human sciences into a powerful, innovative, and socially accountable program developed around NOSM’s Academic Principles and Vision, Mission, and Values. NOSM’s Undergraduate Medical Education (UME) Program is responsible for delivering the four-years of study that lead to the MD degree. Upon completion of the Program, graduates will have earned a MD degree and are ready and able to undertake postgraduate training anywhere in Canada, albeit, with a special affinity for training and clinical practice in northern urban, rural, remote, Indigenous, and Francophone communities. After you have perused our sites, if you still have questions about the MD Program please email ume@nosm.ca. If your question is about admission requirements please email admissions@nosm.ca. “Northern and Rural Health” covers the teaching of cultural competency especially in relation to populations in Northern Ontario such as Francophone and Indigenous peoples, history and geography of Northern Ontario and the history of medicine in the North, health care and service issues in Northern Ontario, and the challenges, benefits and rewards for practising medicine in Northern Ontario. “Personal and Professional Aspects of Medical Practice” covers professionalism, medical ethics, medico-legal issues, and historical developments related to medicine and health, including the practice of medicine and health in Northern Ontario. “Social and Population Health” covers concepts of health and illness, public and community health, social determinants of health, research skills, public health policy, and the organization of health care in Canada. “Foundations of Medicine” covers all of the basic sciences in medicine including the disciplines of anatomy, physiology, pathology, pharmacology, genetics, microbiology, biochemistry, and immunology. “Clinical Skills in Health Care” covers communication skills, components of health history and physical examination of body systems related to various aspects of the life cycle. The five Themes are integrated within the learning and assessment of every case-based module and clerkship of the MD Program. The reinforcement of concepts across the Themes ensures key learning outcomes are being achieved with an emphasis on medical and clinical topics. For further information please see the 2018-2019 MD Program Course Descriptions document. Phase 1 encompasses the first two years of the Program and is organized around eleven case-based modules (CBMs), each of which covers a major body system. In keeping with the School’s focus on preparing students for life and practice in any Northern location, the written cases in each module are situated in a remote, rural, urban, or Indigenous setting. During this Phase, students are located mainly at their assigned host university of either Lakehead University or Laurentian University with a four-week Indigenous community placement in the first year and two four-week rural and remote community placements in the second year. Students undertake a longitudinal program of community and interprofessional learning through Community Learning Sessions (CLS). Year 2 includes a six-week elective block. Phase 2 of the MD Program is dedicated to an eight-month longitudinal Comprehensive Community Clerkship (CCC) during which students are assigned to live and learn in large rural or small urban communities in Northern Ontario, excluding Sudbury and Thunder Bay. Students participate in a wide range of clinical learning activities within the community as well as engaging in peer group learning sessions including Virtual Academic Rounds (VARs) and Distributed Topic Sessions (DTS). Students undertake a reflective research project based in the needs and dynamics of their host communities. Elective experiences are included during this Phase. Phase 3 takes place in the academic health science centres in either Thunder Bay or Sudbury and is organized around a series of specialty clerkship rotations: Surgery, Internal Medicine, Children’s Health, Women’s Health, Mental Health, and Emergency Medicine. The integrated exposure to various specialties and subspecialties in this Phase provides students with the opportunity to assess specialties which they may choose to pursue as career choices. In this Phase, there are opportunities to experience medicine in different settings through elective experiences. In the School’s distributed model of learning, all of Northern Ontario is considered NOSM’s campus. Research shows positive correlation between practical community experience during medical education and the location of a physician’s practice upon graduating. NOSM aims to produce physicians who are capable of practising in Northern, rural, and remote areas and are of such high calibre that they will have opportunities to practice anywhere. NOSM celebrates generalism as a core value in its curriculum. Placements within varied types of communities allow students to develop the diverse skills and abilities typical of the rural Northern physician, where breadth of service provision is substantial. The School’s curriculum development team recognizes the importance of providing an immersive experience in the communities of Northern Ontario in order to promote an awareness of living and practising in these communities and to promote social accountability towards the people and communities of Northern Ontario. To this end, the School has designed placements so that students experience remote, rural, Indigenous, and urban practices first-hand in diverse Northern locales. These placements are essential to meeting the learning objectives of the School. Student participation in all of these placements is a mandatory component of NOSM’s curriculum. NOSM has built a collaborative network of Northern Ontario community partners who are integral to the distributed model and very engaged with us in developing physicians to provide quality care to the populations we strive to serve. In first year, in addition to students’ training at one of the two host universities, Northern Ontario Indigenous communities have requested that students complete a rural/remote Indigneous community placement in their first year of study. This compulsory four-week placement takes place in the spring. Students are sent to communities in groups of two. The placement familiarizes the student with Indigenous lifestyles and the practice patterns of professionals serving remote Indigenous communities. Students will have the opportunity to immerse themselves in their assigned community and to learn from a diverse body of clinical practitioners including registered nurses, health directors, and Traditional Healers. Community placements are carefully chosen on the grounds of preceptor knowledge, technical infrastructure, patient flow, and security. Communities interested in hosting students work with the School to ensure that standards in all of the above areas are met. In second year, students are required to complete two community placements of four weeks each in small, rural, or remote communities. These placements will focus the student on practising their clinical skills and making diagnoses within the rural context, and familiarize them with the diversity of rural communities in Northern Ontario. Depending on resources available within the community, students may be assigned alone to a community or in a group as large as eight. In third year, students are required to complete a mandatory eight-month longitudinal clerkship known as the Comprehensive Community Clerkship (CCC). During the CCC, NOSM provides students with clinical experiences away from Sudbury and Thunder Bay as they live and learn in groups of up to eight students in small urban or large rural Northern Ontario communities. While living in the community, each student is assigned to primary-care practice settings. The aim of the third year curriculum is to provide academic and professionally relevant learning opportunities that, through small-group sessions and clinical practice, exemplify reflective learning and comprehensive interprofessional care. Opportunities to care for patients in a safe and efficient manner are enhanced by the clerkship’s prolonged duration which promotes continuity of care. Students increase their knowledge of medical care through clinical encounters and through the socio-cultural context in which the patients and their families cope and adapt to their health care needs. This social and intellectual process will be encouraged through continuous interaction with community-based health care practitioners. The CCC experience is designed to enhance the students’ personal and professional development. The nature of the course work and the learning-centered environment promotes critical thinking and lifelong learning skills. The CCC provides opportunities to enhance knowledge, skills, and attitudes that are conducive to an understanding of medical practice in remote, rural, and/or underserved communities and contrast that with urban practice. The student observes the skills and attributes of health professionals in stimulating environments and furthering their consideration of career choices including clinical practice and research. There are many communities that participate in the education of NOSM students, all of which are integral to making NOSM’s placement and clerkship experiences possible. The specific communities may change from year-to-year however this list of community profiles is a good representation. The fourth year of the Program is a progression of the Year 3 clerkship (which was done in smaller distributed community hospitals throughout Northern Ontario) which exposes students to secondary and tertiary care of patients in the larger urban cities of Sudbury and Thunder Bay. The purpose of this last Phase of the undergraduate curriculum is to provide students with in-depth experience in various specialties and subspecialties which will lead to fulfilling the graduation requirements of the School. It allows students to observe and participate in the care of patients with problems addressed by various disciplines and provides an opportunity for students to experience the continuum of care which seriously ill patients receive in the North. Phase 3 also provides students with an opportunity to experience, through core and elective experiences, various specialties which they may choose to pursue as career choices in their postgraduate training. Core rotations in seven broad specialties provide students with a thorough background in women’s health, internal medicine, surgery, children’s health, mental health, and emergency medicine. Through electives, students experience medicine in different settings outside the traditional geographic of Northern Ontario. Finally, Phase 3 provides an important background of knowledge that will allow students to graduate and transition into the postgraduate phase of medical education. The MD Program uses a range of assessment modalities including multiple choice questions and written exams, Objective Structured Clinical Examinations (OSCEs), project work, preceptor observation, and encounter logging. There are committees that govern each of the five Themes and each of the three Phases. These committees are responsible for developing questions and other assessment tools throughout the Program. The Student Assessment and Promotion Committee is responsible for the development and implementation of student assessment regulations, policies, and procedures as well as student promotion and appeals policies. There is substantial and ongoing program evaluation throughout the MD Program as overseen by the Office of Program Evaluation and the Program Evaluation Committee. The Office of Program Evaluation gathers copious feedback from students, faculty, community leaders, and physicians on many aspects of the Program. With the goal of continuous quality improvement, program evaluation reports are distributed to all Theme Committee Chairs, Phase Assistant Dean/Directors, and Associate Deans. NOSM’s MD Program has a unique governance structure and is conducted under the authority of the Senates of its two host universities; Lakehead University in Thunder Bay and Laurentian University in Sudbury. The Undergraduate Medical Education Committee (UMEC) reports to NOSM’s Academic Council which makes recommendations to the Senates of both host universities through the Joint Senate Committee for NOSM. The Academic Calendar for the MD Program is therefore owned and validated by the two Universities. If you are a physician or allied-health professional who is interested in becoming a faculty member at the Northern Ontario School of Medicine, more information can be found via Faculty Affairs.